These elegant double sided 4x6 black table numbers are the perfect addition to your Wedding Reception, Engagement Party, Bridal Shower, Rehearsal Dinner, Baby Shower, Bar Mitzvah or any other party or event. 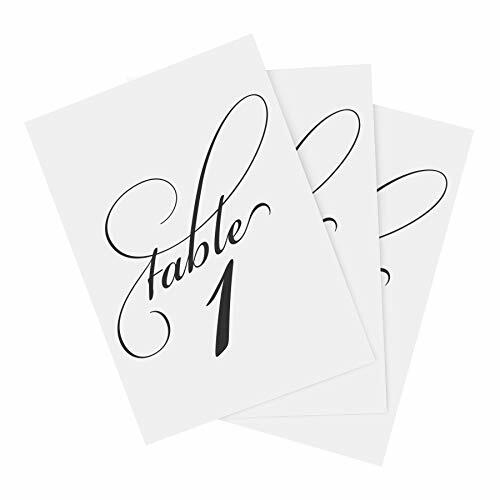 These table numbers look great on an easel, in a place card holder, or when framed. Bliss Paper Boutique table numbers are professionally designed and created by our in-house team. You won't find these designs anywhere else! FULL SET: Numbers 1-25 + BONUS head table card included. Each card is sized at 4x6. STYLE: Features a classic calligraphy design. These table numbers are sure to add some elegance to your reception, party or event. QUALITY DESIGN: Our 4x6 table numbers are printed on high quality 130lb heavyweight uncoated white card stock - perfect for framing or for freestanding table numbers. PERFECT FOR: Weddings, Events, Engagement Party, Rehearsal Dinner, Anniversary Party, Bridal Shower, Baby Shower, Bar Mitzvah Celebration or any party! Be sure to dress up your table decorations with these gorgeous table numbers. If you have any questions about this product by Bliss Paper Boutique, contact us by completing and submitting the form below. If you are looking for a specif part number, please include it with your message.